Health is a big issue in all dog breeds, especially large breeds! Join diseases as the main factor, or at least the factor with main focus, boerboels can suffer from hd or ed in almost al bloodlines ,regardless who or where they are breed. It is not very often we meet boerboels who have severe degeneration in their joints ,as the breed has massive musculature to hold things together. We do not consider hd to be a big problem, we have almost never seen it in our own dogs or dogs we have breed, but there are many much more nasty diseases present such as allergies ,vaginal prolapse ,eye lids ,.... about 300 known conditions a dog can have. So far not many dog diseases are proven to be inherited by genetics most things seem to be environmental provoked or caused things. In general we feel most safe with the old fashion A,B,C- system to evaluate our dogs hip-status, many breeders are very found of the new "pennhip- system" , we think abc is more realistic and covers more aspects of the hip joints as it looks at both form, shape, looseness and whole situation of the construction. Pennhip only focuses on loose or tight index with or without djd, it is of course a interesting studies , the connection between looseness and the chance to get djd , but seriously... basic all old dogs get djd in some degree ,i have not meet a single German Shepard or other working breed for that matter,over age 9-10 years who didn't have djd, so to base a whole breeding evaluation on a more or less chance of getting djd sooner or later in a dogs life that doesn't make any sense ! One other fact that bugs me about the whole pennhip fever is that idea ,that the solution to djd should be to breed the dogs more tight in the hip joints.. if that was the solution, one may expect to se differences in dog breeds seen from their background; fx one would expect a former Eskimo breed, a breed that has been chosen for hundreds of generations by its ability to drag stuff over the ice , a life essential need for humans who have lived in areas of the planet where they depended on their dogs... one would expect those dog breeds to have a significant more tight construction of the hip joint... but guess what they are just average around 0.50-0.55 as all other breeds regardless of historical backgrounds. For us it seems clear that there are other factors who play a role ,but what they are and how to breed them out no one knows for sure yet.Hopefully we will learn more in the centuries to come, until then the only logical thing we can do is to test the dogs and disc the ones who show the signs . Apparently the boerboels biggest health issue is in the knees ,they tend to blow the ligaments who hold everything together.. normally it happens during their first 1,5 years, but also older dogs can get it . We have seen a few cases inside our own breeding s, from our first 2 litters ,a total of 19 dogs ,5 dogs did blow the ligaments, that is a total of about 25% ! There is no known cause or reason for the problem, no research has proven any genetic connection ,nor is there any clear relation between the dogs who blow their knees and the ones who do not. We have try to find a clue; fx would the dogs with longer pasterns have a bigger chance than the more short legged ones? apparently no.. both large and long build dogs get the problem same amount as the short and bully build ones. There is no difference between the way the dogs live, some are active all day long, others live more calm with less activity ,also there is no clear connection. 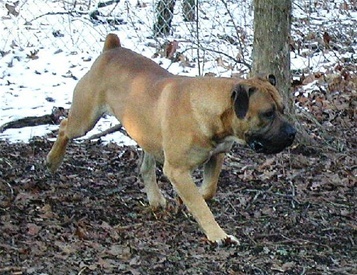 We have discussed the topic with many breeder worldwide, everyone has seen knee defects in their breeding s, not all admit its existence but as the boerboel community still is small ,none can truly hide anything for long, so our conclusion is all boerboel lines have some degree of knee-join issues more or less. One of our friend had a female ,actually one of the oldest known boerboels in Scandinavia, she got 12 years old ! her first 6 years she was used as working-guardsman dog.. she had some degree of limping at the age 3-4 years, her owner who is used to dogs being finished at about 5-6 years of work did take her out of the job when she was about 7, at that point he made a xray to see how much hips there would be left after all those years with hard work.... surprise ! she had A/A hips but not the slightest signs of any ligaments in her knees.... according to the vet they had been gone for years! This amazing dog lived on as my friends family dog for a other 5 years and finally died of a infection in her uterus. 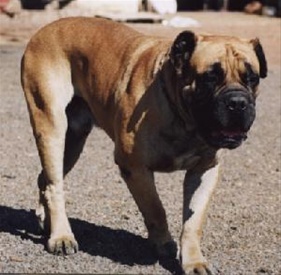 This very same dog was by the way the first boerboel we meet she was 10 month old at the time ,i guess she was the dog who made us fall in love with boerboels! that is a tricky thing we also have discovered inside the boerboel breed, epilepsy can hide it self as a recessive gene being cared from generation to generation until two positive parents meet in a breeding. If the gene is present in both parents their children can get epileptic attacks witch destroy their life quality and may even kill them. If there is known epilepsy in the line one needs to do a bloodtest on the dogs to determine if they are carry the condition in their genetics or not, exclude the ones who have it from breeding and there by eliminate this problem.